One of the most popular types, and a home garden favourite for decades, Radish ‘Sparkler’ is an attractive, reliable globe variety with very crisp texture and mild peppery flavour. Full of character but easy on spice with shading from brightest scarlet to pure white is dotted with merry flecks. Now available as Certified Organic seed, ‘Sparkler’ is easy to grow, high yielding and quick to harvest, ready in just three weeks it ranges in size from 2 to 4cm (1 to 1½in), with a white root. They can be grown wherever there is sun and moist, fertile soil, even on the smallest city lot. Sow successively at two week intervals until late-spring and then again in late summer. It can also be grown under glass during the winter months to provide a constant supply of crisp, crunchy roots. There's no beating this delightful little two-tone jewel for quick harvest, mild peppery bite, and terrific plate appeal. 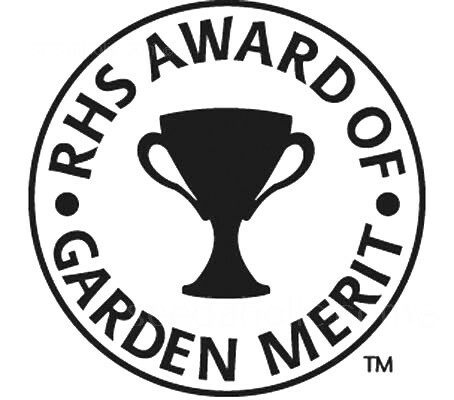 Radish 'Sparkler' was awarded the Royal Horticultural Society’s Award of Garden Merit (AGM) in 1996 which was reconfirmed in trials in 2013. Radishes prefer regular garden soil, especially soil that was heavily manured in a previous season and allowed to rest. Radishes can handle a little shade, especially if the temperatures are creeping up, but they need several hours of direct sun to fully develop. Radish can be planted from as early as the soil can be worked. Make successive plantings of short rows every 10 to 14 days. Plant in spaces between slow-maturing vegetables (such as broccoli and brussel sprouts) or in areas that will be used later for warm-season crops (peppers, tomatoes and squash). Sow thinly, 0.5in (1.5cm) deep in rows 9in (25cm) apart. Keep moist and thin as necessary. Proper thinning focuses the harvest and avoids disappointing stragglers that have taken too long to develop. Slow development makes radishes hot in taste and woody in texture. Repeat sowings every two to three weeks to ensure a continuous supply. Remember, it is much more economical to sow little and often rather than have a long row of radishes all coming to maturity at the same time. If you want good-tasting radishes also pay close attention to the watering regimen you provide. Moisture stress can result in the same woody, hot radishes that poor soil conditioning and lack of fertiliser or humus will result in. Plants will be ready to harvest when they are of usable size and relatively young from 21 days, starting when roots are less than 1 inch in diameter. Radishes remain in edible condition for only a short time before they become pithy (spongy) and hot. Gently hold the tops twist and lift. Remove the tops by twisting them off with your hands. The tops are very tasty and can be cooked and eaten like spinach. Save the young thinnings of both summer and winter radishes. They are delicious with tops and bottoms intact. Both summer and winter radishes store well in the refrigerator once the tops have been removed. The radish leaves cause moisture and nutrient loss during storage. Store greens separately for 2 to 3 days. Refrigerate radishes wrapped in plastic bags for 5 to 7 days. Store roots in dry sand, soil, or peat for winter use. As with any Brassica member, mustard oils are responsible for the tangy taste of radishes. All varieties are excellent sources of Vitamin C and, ounce for ounce, have about 42% as much as fresh oranges. Just like carrot tops, radish greens can be used in a variety of dishes, including raw in blended drinks or in salads. 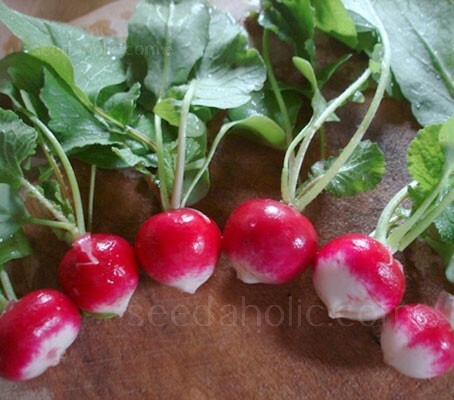 Radishes are high in Vitamin C, folate and potassium. They are known to relieve indigestion and flatulence, as well as being a good expectorant.